A lot has happened since the end of the last earnings cycle, the primary and most obvious being a 12% correction in the US equities market. The correction was driven by fear of rising interest rates and then later political turmoil stemming from the White House. Trump's trade war, conflict within the Presidents inner circle, scandal (choose one) and now Syria/Russian tension have all taken their toll on market confidence. I for one am questioning what the President will be able to accomplish over the remainder of his term. Regardless the fear, long-term fundamentals are firmly skewed in favor of bull market conditions. On the economic front, growth is accelerating; the CBO just raised their 2018 GDP outlook to 3.0% and many others are making similar revisions. No reason to expect a recession or major bear market. 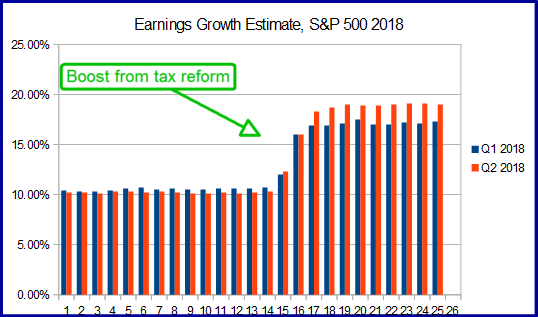 On the earnings front growth is also accelerating, aided by tax reform, and will likely top estimates this quarter and over the next 3 to 4. 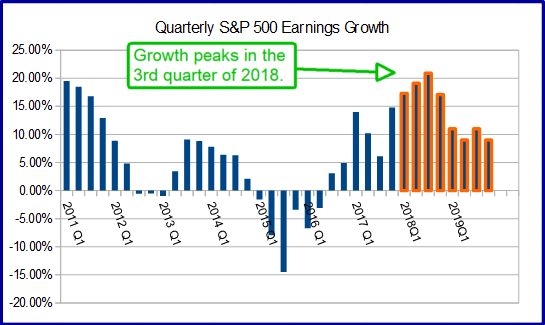 What this means now is that earnings growth is positive, earnings growth is robust, earnings growth is beating expectations and outlook is on the rise, conditions I view as very bullish. Just the other day JP Morgan CEO Jamie Daimon made some comments I found interesting. He said the market is underestimating earnings growth and did so the day before JP Morgan released its earnings report. JPM beat estimates soundly and provided a positive outlook, if the rest of the broad market does the same earnings growth for the 1st quarter could top 20% by the end of the cycle and the year. Looking forward, earnings growth is expected to continue at a double-digit pace for at least the next two years. The one negative I see is that, after topping 20% in the third quarter of this year, growth is expected to decelerate to only 17% in the 4th and then to 10% for all of 2019. This may cause another correction or sector rotation later in the year as money managers prepare for a slower growth environment. The upside is that earnings growth estimates for this year and next are too low which means upward revisions will help support the market. Of the 11 S&P 500 sectors all 11 are expected to grow and of those seven are estimated to produce double-digit results. 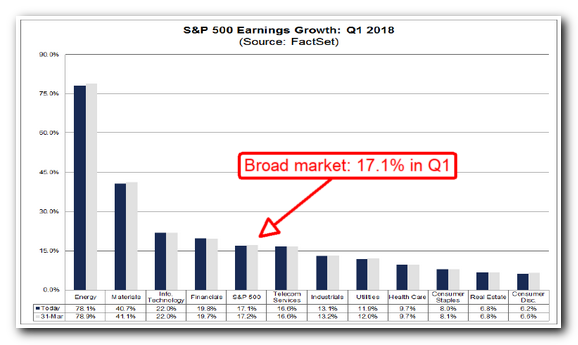 Based on expected strength in earnings I would not be surprised if the cycle ended with all 11 producing double-digit earnings growth. The energy sector is expected to lead with growth well above 75%. The S&P 500 moved up to break my 2,800 target over the first three weeks of January. Then, hot inflation data sent the market into a tailspin on fear of rising interest rates. The broad market S&P 500 fell a little more than 340 pts, about 12%, over the first three weeks of the correction and set the index up for a trend following bounce from long-term support. Since then the index has tried to rally but gains have been capped by political fears. 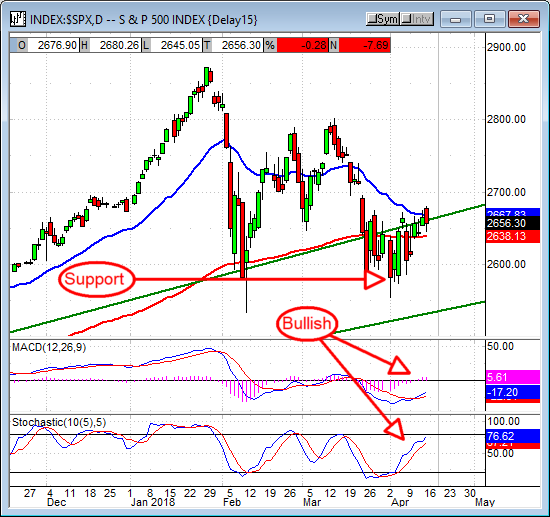 The indicators are both still bearish suggesting support in the 2,600 range could be tested further. I still expect however, based on convergences between the indicators and the January all-time high, to see those all-time highs retested at some point in the not too distant future. The daily chart of the S&P 500 looks more bullish than the weekly chart. The index has formed a bottom just below 2,600 and is now bouncing higher. Prices are still contained by near-term resistance but I expect to see that resistance break down in the face of stellar earnings and outlook. The combination of signals, the break above the long-term moving average confirmed by bullish crossovers in MACD and stochastic after bouncing from strong support, constitutes a strong, technical, bullish trend-following entry for me. The fact earnings season is at hand is not a coincidence. The biggest story in earnings over the past 2 years has been the energy sector and it will dominate in 2018 as well. The sector is expected to post-market leading growth in the range of 75% this quarter and those estimates are likely low. Full-year 2018 estimates have been revised higher in the wake of tax-reform and will likely get revised higher again with WTI trading at fresh three year highs. My only concern is that outlook for oil prices is still bearish. The EIA has raised their average price forecast for WTI in 2018 but it is still at the bottom of the 2018 range suggesting a big drop in oil prices (and earnings power for the energy sector) is coming later in the year. 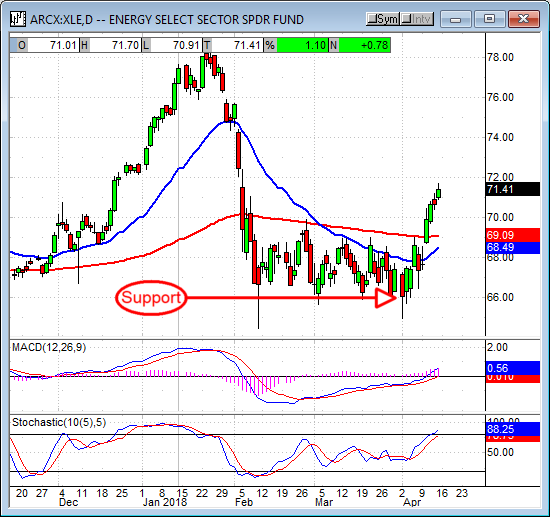 My target of $78 for the Energy Sector SPDR XLE was hit just a few weeks after writing the last earnings cycle update. Since then the ETF corrected along with the broad market but led the decline with a drop near -18%. Over the past month it has formed a solid looking bottom near $66 and begun to bounce higher. This bounce is supported by the indicators with are both bullish and showing some strength. The $72 level looks like a possible zone of resistance that, if broken, could lead to a test of $76 and possibly the the all-time high at $78. I am bullish on the energy sector. The materials sector is still expected to be the second strongest performer in the first quarter and 2018. The sector has seen estimates come down a bit over the past two weeks but they remain robust at 40% this quarter, 42% next quarter and 24.4% for the whole year. The risk with this sector is that growth will slow sooner and more abruptly than with other sectors. With the full year expected to average only 24.5% it is likely the second half will see growth in the rang of 10% compared to 41% for the first half. The silver lining is that growth is expected to continue at a pace near 10% through the end of 2019 at least. I was bullish on the materials sector last cycle and it did move up to set a new high, right before it corrected along with the broad market. 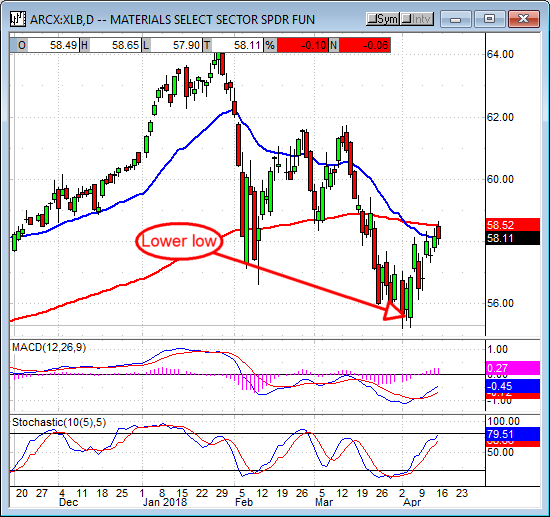 The Materials Sector SPDR XLB corrected an above average 14% in a move that set a deeper low in March, contrary to the broader market. This may result in a trading range for the sector as traders focus on sectors with better growth prospects. Resistance is currently at the short-term moving average, a fall from there would be bearish for the near term. 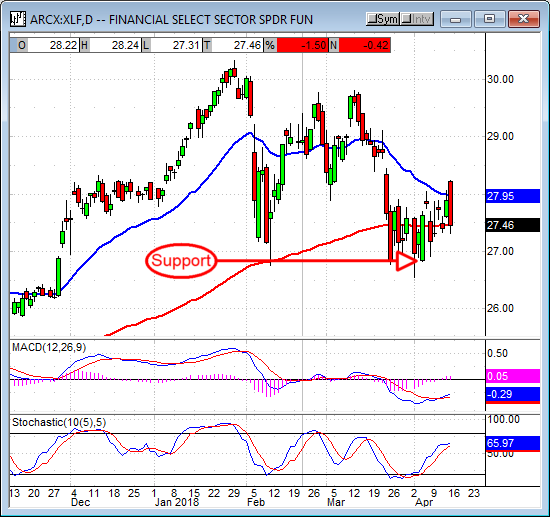 Support is likely near $55.50 if the ETF does move lower. A break above the short term EMA would be bullish and trend following but face resistance at $60 and $62. I am bullish on the materials sector. The information technology sector has been one of the best performing over the past few years and is expected to continuing performing strongly over the next two. The sector is estimated to produce the third strongest growth this quarter and next, about 22%, with growth tapering off to near 12% by the end of the year and then averaging 11% in 2019. There are some concerns with earnings from names like Tesla and Facebook that could hurt sector-level results in the near term, longer term the roll-out of the Internet of Things and AI will drive growth in the sector. Estimates differ but generally agree that the number of connected devices will top 50 billion by 2025, a growth of nearly 600% from 2017 estimates. Chipmakers, as the power behind all things digital, will be at the forefront. I was bullish on this sector last update and I am still bullish on it. The Information Technology SPDR XLK corrected about -12% along with the broad market but has outperformed in the time since. The ETF bounced quicker, move up faster, set a new all-time high and, on the second test of support, is outperforming the broader market once again. Support is at/near the short term 30 day EMA and the indicators are bullish so I am expecting to see prices rise. My near-term targets are near $68 and then just above $70 at the all-time high. A break of the all-time high would be bullish and bring targets near $75 and $80 into play. I am bullish on technology. The utilities sector is expected to maintain earnings growth near 12% this quarter but the outlook is tepid, almost cold, compared to other sectors of the market. The sector is expected to see earnings shrink in the second quarter, -0.7%, and average only 8.2% for the year so it is no surprise to see it has been trending lower over the past few months. Next year, calendar 2019, the utilities sector is expected to post the weakest growth of any sector on the market, only 5.2%, so no big rebound in prices should be expected. The only things it has going for it right now are dividends (the XLY pays 3.5% compared to 1.85% with the SPY) and it is very cheap for those looking for diversification or yield. To say the XLU Utilities SPDR outperformed the market during the February correction would be misrepresenting the facts. The ETF did correct only -7.5% in the time the broader market fell -12%, but that -7.5% came after a -10.35% decline that left it down nearly -18% from its most recent high. My target of $48 was reached in early February where a bottom may be forming. 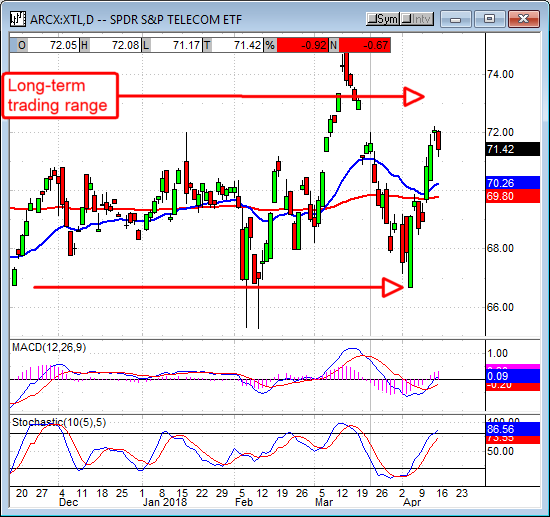 The ETF is currently trading near $49.75 and below resistance at the short-term moving average. The indicators are bearish and pointing lower, in line with the near-term trend, and suggest a move back to retest support could be coming. Firm support is likely near $48 provided earnings and outlook do not disappoint the market. A break below there would be bearish. I am bearish on utilities. The financial sector is expected to be the second strongest performing for all of 2018 with growth in the range of 26.8%. Considering that the first of the banks have already reported first-quarter earnings and beaten the consensus estimate, I'd say the full year outlook will be raised in coming weeks. Growth is expected to expand in the second half of the year, to over 30% compared to 19.2% in the first half, which should help propel stock prices in the near term. Longer term, as in next year, the sector is expected to see growth moderate to near 10.5% and in-line with the broad market. I was bullish on this sector last quarter and I am bullish on it this quarter. The difference is that last quarter the market hit resistance at a generational high, a high from which it corrected, and this quarter it is consolidating at support following a major correction. The XLF Financial Sector SPDR took a dive on Friday following the release of earnings from JPM, WFC and C which all produced better than expected earnings growth, just not enough to spur investment. Regardless, the sector appears well supported at $27.50 with positive forward outlook. A bounce from this level would be bullish and trend following with a near-term target at the current all-time high. I am bullish on financials. The consumer staples sector is expected to see growth over the next two years at least. Growth is expected to be a little stronger this year than next, 11.4% compared to 8.9%, but relatively steady and supported by two things; improving labor markets and an expanding population. While not a huge growth opportunity this is another safe sector with above average yield investors tend to turn to in uncertain times. The Consumer Staples SPDR XLP came just shy of my $59 target before correcting in February. The sector fell a little more than the broad market, correcting about -13%, before hitting its bottom. The ETF is now trading just below resistance targets at the short-term moving average with mixed indicators, MACD says momentum is bullish but declined over the last two price peaks while stochastic trends sideways following a bearish crossover. This set-up could lead to further upside, or a retest of support at $51, depending on what traders do now. A break above the short term 30 day EMA would probably find resistance at the long-term 150 day EMA. 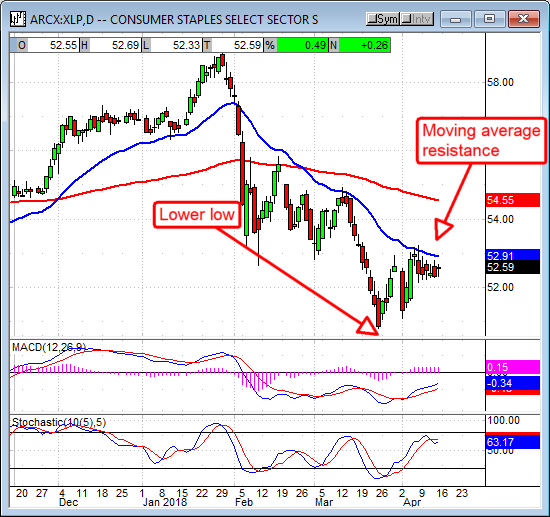 I am neutral on consumer staples. 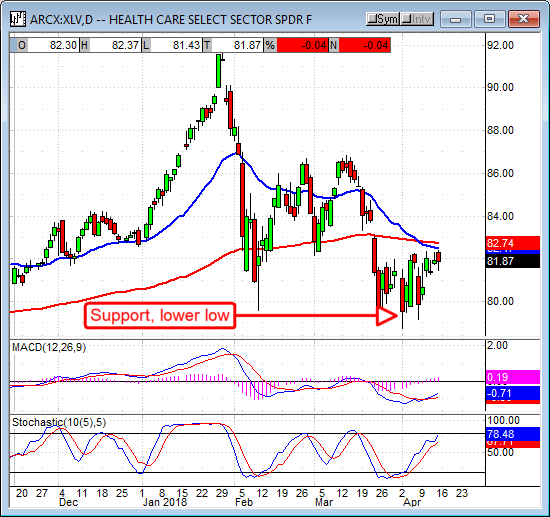 The Healthcare SPDR XLV exceeded my $89 target in late January before correcting in February. The ETF shed about 13.5% in the first wave of selling and found its support just above the lows. It is now facing resistance at the pair of moving averages and looks like it will continue to test resistance if not break out to new highs. A move above the resistance zone, just below $82.75, would be bullish and in line with the long-term trend. Nearer term the ETF is still range bound and moving sideways with possible resistance at $86, 90 and then the all-time high. I am bullish on healthcare. The real estate sector is expected to produced earnings growth over the next two years, but it is not going to be a market leader. This year, calendar 2018, the sector is expected to deliver growth in the range of 5.4%, the slowest of any S&P sector. Next year earnings growth picks up but only to 6.7%, third to last. The XLRE Real Estate SPDR yields about 3.5% at current levels, near $31, a factor that will lend support over the long term. 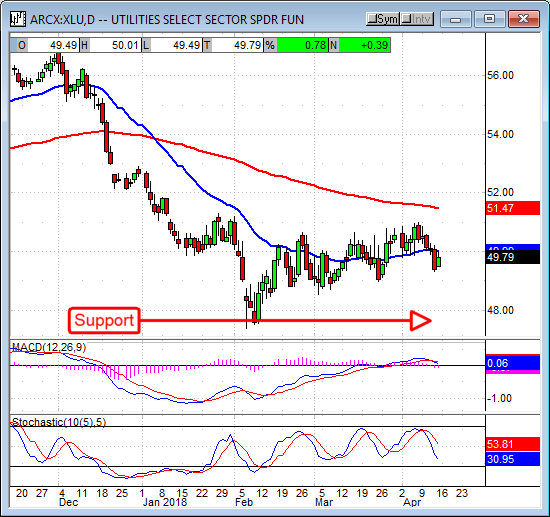 At last glance a break below $32 for the XLRE Real Estate SPDR was a possibility but not expected. The ETF did in fact break $32, retest it and fall sharply from it. Support was later found near $30 and is so far holding. 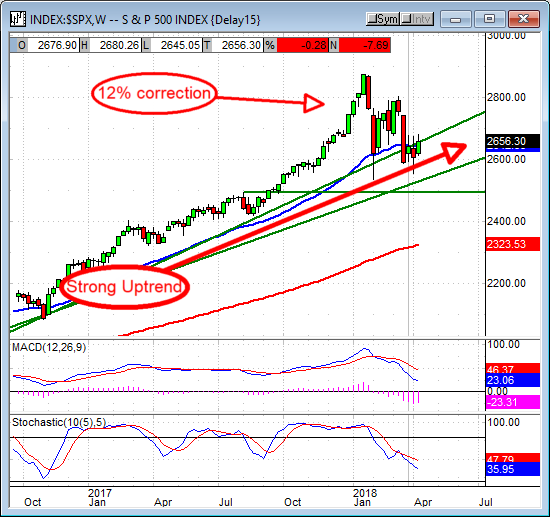 The indicators are bearish and suggest another test of support may come. A bounce from current levels would be bullish within a long-term range. My targets for resistance are $30.80 and $31.60 in the near term. A break above $31.60, the long-term EMA, would bring targets at $33 and $34 into play. I am neutral on real estate. 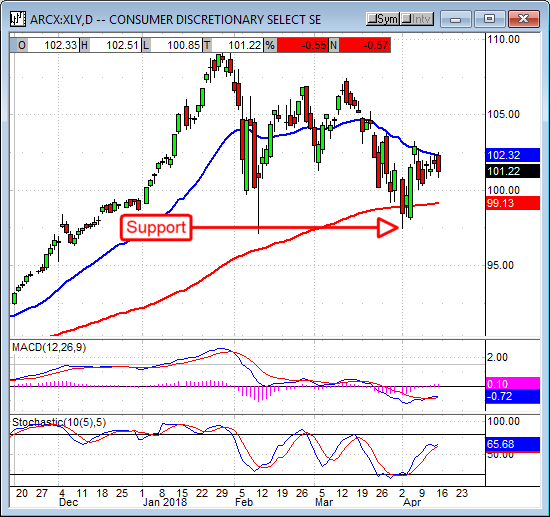 The Consumer Discretionary sector is my top pick regarding earnings growth and outlook. The sector is expected to produce a weak 6.3% in the current cycle, up from the previous, and then see growth accelerate to 20% by the end of the year. The full year 2018 earnings growth estimate is 15.5%, the 6th fastest pace in the S&P 500, and then slows in 2019 to 12.9%. The silver lining is that, although growth slows for consumer discretionary next year it will be the 2nd fastest growing sector in 2018, making it a prime target for longer-term gains. The Consumer Discretionary SPDR XLY moved up after the last update, as expected, but gains were capped by fear of rising interest rates. Rising interest rates may put a damper on economic growth, and economic growth is fueling profits in cyclical sectors like discretionary items. The sector outperformed the broad market during the February correction, falling only -11%, and will likely outperform over the next few quarters. 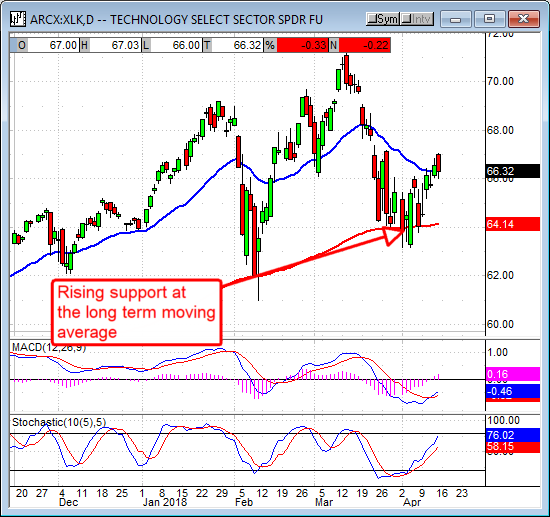 The ETF has bounced from the long-term moving average and now faces resistance at the short-term moving average. Price action suggests a consolidation is underway that may lead to further upside. The indicators are bullish and both pointing higher, consistent with rising prices, with only the short-term moving average to stand in the way. A break above that, near $102.30, would be bullish and in line with the prevailing long-term trend, my targets are $107.50 and $110.00. I am bullish on consumer discretionary. The Industrial sector is expected to show earnings growth above 13% for the 1st quarter, just below the index average. Growth is then expected to accelerate into the end of the year, growing above 20%, before decelerating to 12.6% in 2019. In 2019 it is expected to be the 3rd fastest growing and another good target for longer-term investors. 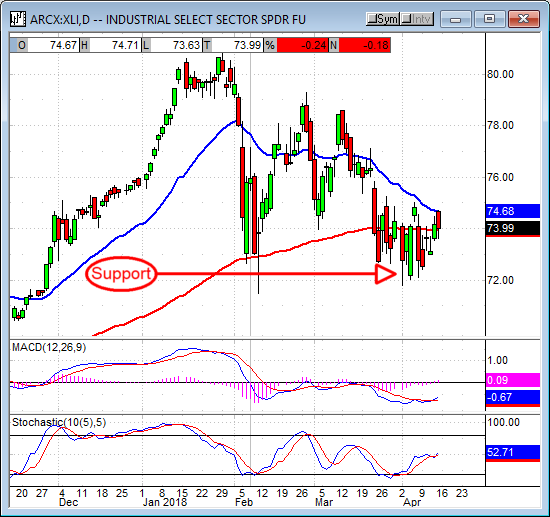 At last look I was cautiously bullish on the XLI Industrial Sector SPDR due to divergences in the indicators. That caution proved to be wise as a deep correction soon followed. The ETF is now consolidating at the long-term moving average and looks like it will move higher. The indicators are both bullish and pointing higher forming a strong bullish entry in line with the trend. There may be additional resistance at the short-term moving average but price looks read to advance. I'm bullish on this sector. The Telecom sector is expected to post fairly robust earnings growth this cycle, about 16.5%, but then growth peaks out in the next. By the end of the year, growth will retreat to near 0% where it will remain for all of next year. Next year, at 2.8%, the telecom sector will be the weakest growing sector of the market. The XTL Telecom SPDR corrected along with the broader market, outperforming on the way down and during the first rebound from support. Despite the outperformance, the ETF remains range bound over the long term and likely to stay that way into the long term. I am neutral on this sector. I remain bullish on the market due to earnings growth and the outlook for next year. Because growth is expected to peak in the second half of this year, and because the markets growth leaders are expected to be different next year, I am a bit cautious in that view. A change in market leaders means, ultimately, a massive sector rotation. This type of activity could put a damper on gains, cap them at resistance targets and/or set the stage for another correction later this year. At the very least it will add volatility to trading. I am only bearish on one sector, the utilities, but view weakness in that sector as an attractive entry point for yield and diversification. I am neutral on consumer staples, real estate, and telecom but firmly bullish on the rest. Of the sectors I am bullish on, I am the most bullish on energy, materials, the industrials and financials, all expected to produce strong earnings growth this year and lead earnings growth next. Until then, remember the trend.